This one room St Petersburg apartment is furnished with a king size bed, pleasant decor with a living area that includes comfortable sofa and armchairs, color TV and telephone with free local calls. 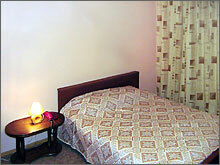 A fully furnished kitchenette with breakfast table and chairs allows occupant to dine in. The roomy ceramic tile bath has bathtub/shower combination. Amenities include washing machine and ironing board. Access via key code gate and entrance door. Just steps away from Hotel Astoria, Bronze Horseman, the Senate Bar, the Hermitage, the Amiralty, St Isaaks's Catherdral and Nevsky Prospect the main artery and heart of the city.